Long lived and low maintenance. Deserves wider use. Division not needed or recommended. Foliage remains attractive all season. I would grow Dropwort for the attractive lacy foliage even if it never flowered. 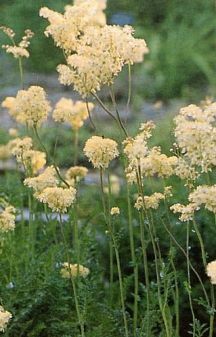 Unlike most members of the meadowsweet family, Dropwort does not require a moist, rich situation; it is quite content in average garden soil. It is best in full sun but will tolerate some shade. Dropwort flowers from early to midsummer. The white sprays appear atop 18 to 24 inch stems and are lightly fragrant. It is a good choice for mixed borders and provides nice contrast to pink and blue flowers. It also makes a lovely albeit short lived cut flower. New plants or divisions should be spaced about 12 to 18 inches apart. Most of my references suggest frequent fall division. I've had better luck in the early spring and find that division is needed only every third year or so. Look for weakening in the center of a clump as a signal to divide.